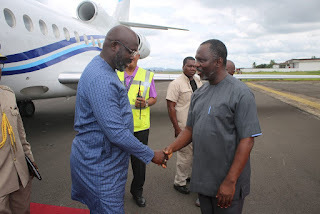 On Friday, May 25, 2018, President Weah responded to criticism of him buying a private plane, at the Foreign Ministry when he presented two buses to the Ministry of State for Presidential Affairs for use by employees. “The airplane issue is causing problem. We don’t have a bus, how will we buy a $30 million plane? Where do they get this kind of news from? It is not possible for us to buy a plane for $30 million; we are just coming to office”, said President Weah. Well, if he didn't buy the plane, how did he get it? “The airplane they are talking about is for my friend, who is the manager of a big company in Burkina Faso. He told me to use it anytime I want to travel because he has seen me use planes owned by Ivory Coast and others. He wants me use a plane that is not labeled to boost my moral too,” the Liberian President added. He reminded Liberians that he is a celebrity who has so many friends that are willing to help him in whatever way they can.